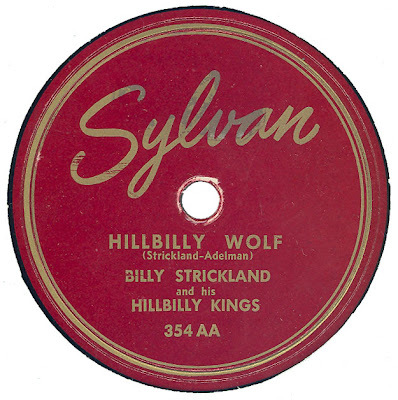 "Hillbilly Wolfe" was later recorded by Dave Dudley & Link Wray for an album on the Guest Star label probably in the late 1950s or early 1960s. Is it known if this was a Ben Adelman recording? I ask because of the "K. Adelman" writing credits, and the "Hillbilly Wolf" reissue on Regal could be consistent with Adelman connections, e.g. other Adelman recordings shopped by Lillian Claiborne. I had also wondered if the Empire label of New York (Eddie Reed) was related to the D.C. Empire label, which had some Adelman studio stuff, although obviously "the Empire State" nickname for New York could be the source for that. Thanks for all the great work. I'm obviously not as knowledgeable as the others who have commented on this, but I love Hillbilly Wolf! Thanks. I just talked to Jimmy Efantis, the 94 year-old electric steel guitar player, who was with Don Kidwell on Sylvan 350. He remembers recording it during the 1948 Petrillo Recording Ban. No question that Ben and Kay Adelman are involved as they worked on the Bill Grammer sides for Scoop with Jimmy. Who owned the label is another matter. Galen Gart does not list an owner in ARLD. Empire DC was an Adelman operation in its entirety.